The Tarok would be the perfect competitor against the Honda Ridgeline. We're all waiting on bated breath for Volkswagen to enter the pickup truck fray. Rumor has it that the Amarok may make it here thanks to platform sharing with the new Ford Ranger, but that has yet to be 100% confirmed. It's a truck we'd love to see here. Then there was the big Atlas-based Tanoak Concept last year, a more upscale big truck than the Amarok. Well, now there's a new VW pickup, and it's smaller than both. It's called The Tarok, and it'll show up at the New York Auto Show next week. The Tarok is more of a lifestyle truck than a rugged off-roader or hauler. The look of the Tarok is very modern with a wide fascia and grille, along with a lot of LED lighting that probably wouldn't show up on a production version. a big skid plate up front, roof rails, and contrasting trim at the C-pillar give it a slick look. The headlights and taillights capture the look of current VW models, as well. We love the tail section that's unconventional for a pickup with its long wraparound taillights. It's a four-door, short bed. It looks like more of a double cab than a large crew cab (since the pickup is small), and the big draw appears to be the versatile bed where the cabin panel folds down to open up the bed for longer items. It changes the four-foot bed into a six-footer, which would be a boon for the outdoorsy folk who want to haul small kayaks or surfboards. Even bikes might make it in there. Plus, the 2,271 lb-payload is plenty. No word on towing capacity, unfortunately. The Tarok also uses VW's versatile MQB platform that undergirds much of its current lineup. The truck is a unibody (versus more rugged body-on-frame) construction that's 193.5 inches long, pretty short for a four-door truck. And don't look for mad power since it has a mere 1.4-liter turbocharged four-cylinder that delivers a not-overwhelming 147 horsepower. It's mated to a six-speed automatic transmission and a VW's 4Motion all-wheel drive system. Step inside, and you'll find a very VW setup, which is pretty sweet as we've seen in the current Jetta. The 9.2 infotainment screen looks crisp and decently sized, and the body-color trim is a nice touch. It doesn't look very concept-like, and it's likely that this would be the production interior if the Tarok became a reality. We don't see anything that's not feasible here. That's a very good sign. 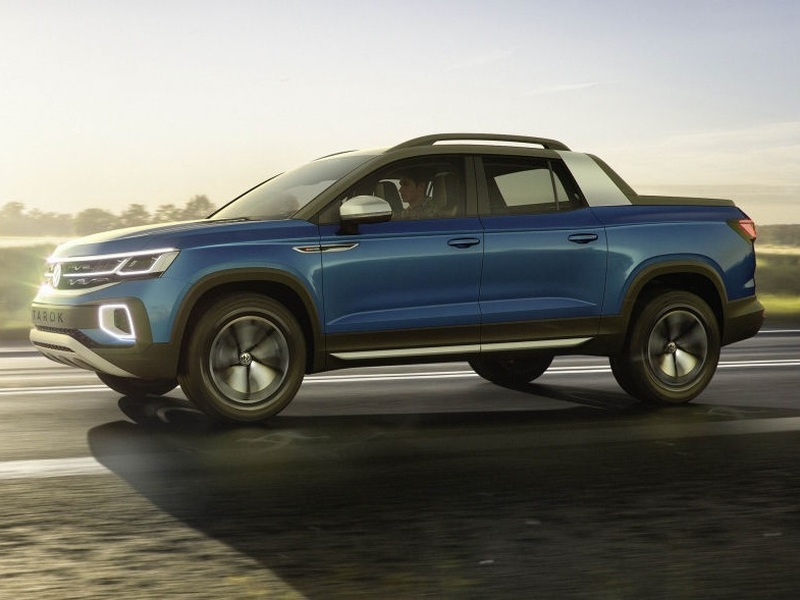 VW plans on seeing how public reception for the Tarok is after debuting in New York, and it's also keeping an eye on unibody truck sales here with the Honda Ridgeline, with which the Tarok would compete, as well as the upcoming Hyundai Santa Cruz. The market is ripe for trucks like this especially since there's been solid growth with pickups overall. Unibody trucks like the Tarok would offer customers an additional measure of utility and ruggedness beyond standard crossovers without them having to commit to a tougher, less efficient body-on-frame vehicle. We'll see what the future holds. Hopefully, at least one VW pickup truck concept will become a reality.